Bonnie Fortune and Brett Bloom are busy, busy people, actively engaged in writing, curatorial projects, and social practice. 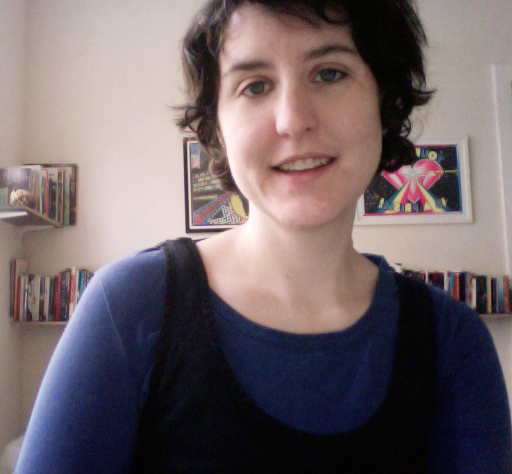 Bonnie's work explores issues of social and environmental ecology, appearing in publications such as AREA magazine and venues like the Roskilde Museum for Contemporary Art, Frist Center for the Arts, and the Center for Book Arts. Brett is part of the long-running artist collective Temporary Services, who as part of their amazing work run the publishing imprint Half Letter Press. His own writing focuses on the use of urban space. 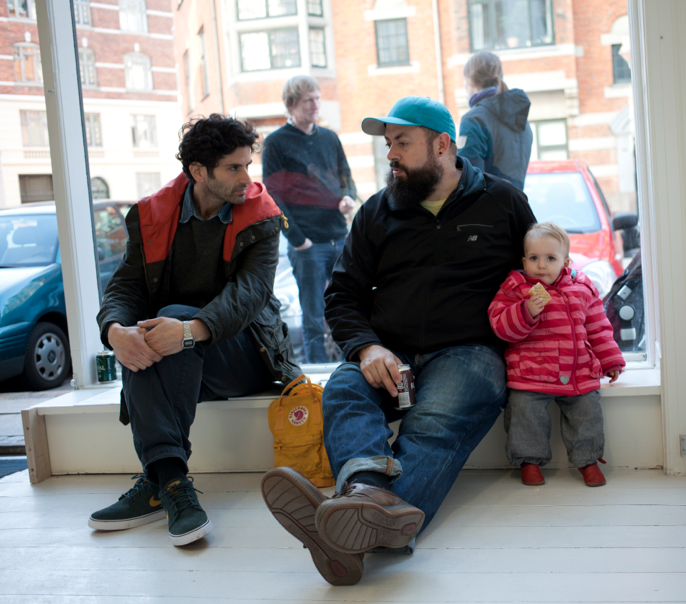 As new parents they have actively taken up issues around parenthood and creative collaboration. One of their more recent undertakings is the Mythological Quarter, an ongoing online 'project in thinking ecologically about the world in which we live,' which includes its own fantastic artist-parent interview series. Bonnie and Brett recently relocated from Chicago to Copenhagen, where they are raising their daughter Ada, 17 months old at the time of this interview. CR: How do each of you find a balance between parenthood, art making, and day jobs? What strategies have you stumbled upon that you might recommend (or recommend avoiding!) to other artist-parents? Bonnie: I have less time to wander aimlessly with my thoughts, read tons of books, and engage in long drawn out discussions. Upside: I have to make decisions and go with them, if I ever want to get anything done. This is what we are doing. Boom. Go. I think I might actually get more done this way. We live in Denmark, a social democracy that gives all mothers quarterly money for supporting a child regardless of income and supports paid maternity leave and subsidized childcare. As an international, I don’t get the paid maternity leave because my work history is not long but everything else I do benefit from. While Ada is in daycare, I work on my art work. When she is not in daycare I take care of her. If Brett, my partner is around, we split up the day. It took us several months of discussion and talking to friends, but we figured out a way to make it work when we have no one else to watch Ada. We take her with us to conferences, openings, and travel for exhibitions. More common than you might think because we also share a collaborative art practice and have to negotiate events that we are both invited to. A recommended strategy, if you are both artists, is to maintain open lines of communication with your partner and even if it takes writing it down, agree on scheduled studio time. Even if the studio is just a closed door in the home. Also, sleep deprivation is real and can turn you into a crazed person, so when negotiating calculate in an emotional wiggle room to deal with the sleep deprivation talking. How has parenthood affected your creative practice and/or the work itself (aside from time-management above)? Bonnie: I made a project before I had Ada where I interviewed mothers who are artists about their experiences with parenthood. The project was called 22 Reviews, after a Lucy Lippard quote ("to the Editors - Here with the 22 reviews. Sorry for the delay, as I had a baby.") I asked the women about their feelings, their ability to make work, how they managed the balance of care with their partners. Nearly everything the women said about what happened to their practice after children has been true for me now that I have child. And the number one thing they said> No time. Some of the women I spoke to expressed ambivalence and being parents, some were no longer practicing artists, some were single moms, some had split with their partners, some had been in art school while parenting young children. I played edited versions of the interviews on a museum audio guide that visitors could check out while they looked at a display of the art works. So, I guess you could say I did my research. I knew what to expect in terms of art making when becoming a parent. And still it’s hard. If we didn’t have the Danish state subsidizing our current experience, I am not sure I could handle full time child care. 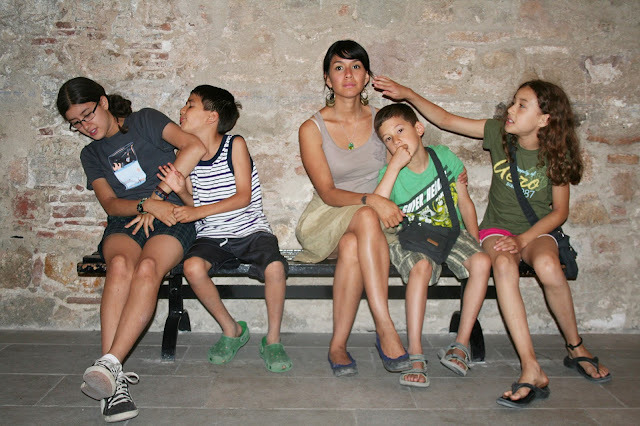 My friend Camilla, who is an artist and parent to two boys here, says that no one tells you that the first couple of years when they are small are still so hard. People have sympathy for you when you have a newborn, but toddlers don’t always sleep through the night either. Brett: Learning how to work across constant interruptions is still not going well, though it is better than when Ada first arrived. It has certainly shifted the focus of some of our work. We are preparing work for an exhibition that opens this week. We have collaborated with Ada on some aspects of the project. We are also investigating how domestic spaces are pressured into reproducing micro-nuanced and micro-managed consumer behavior and attitudes from before a kid even shows up. We are bring the same serious in our work to issues that affect our child as we would work we have done about health care or asylum seekers. 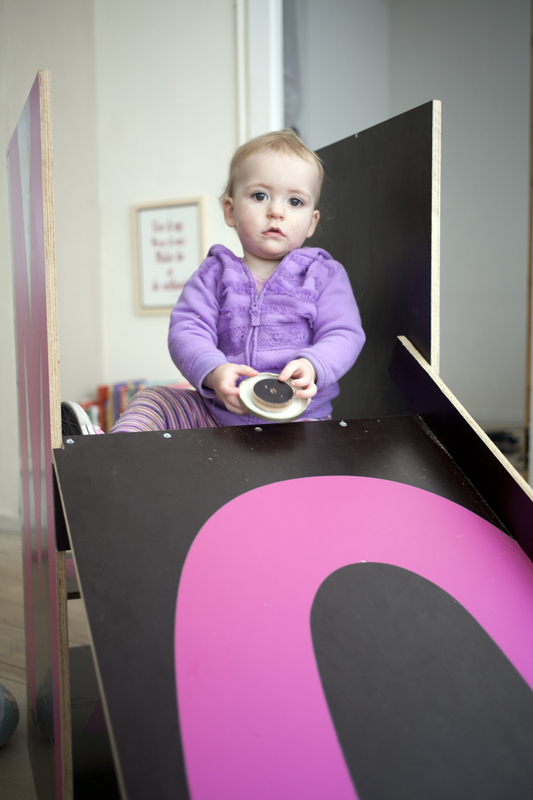 Bonnie: The Alphabet Tower and it is a playgym and slide made from recycled materials. We would build something and then Ada would test it out, and we would modify the design after each test to better suit how she actually used it. She threw some materials down the slide and it gave us the idea to make toys from these discarded materials. We hope to do more concentrated collaborations with her in the future, exploring learning, play, and how we interact with our environment. 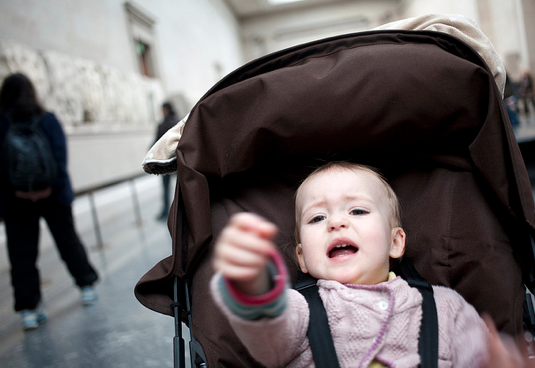 Has having children affected your relationship with the art world? What alternative structures might make the art world more inclusive for artists with families? Bonnie: I have never been fully involved in the commercial art world. I have always participated in a non-commercial, socially engaged artist activist community. That said, (and I have written about this elsewhere) there is a certain expectation that one is a mobile professional free from family obligations–and perhaps this is the same in any professional community, but I find that in the art world when you show up with children, you are instantly seen as unprofessional in certain contexts. Perhaps you are not fully committed to the job? I have been at many conferences with people with children and the boisterousness of children was frowned upon. So, my inclusivity suggestion, and this goes for people with sick parents, partners, or any other form of dependent– be more open to the lives people lead and allow for messy moments. Create child friendly spaces at art gatherings. Consider holding openings in the afternoon so children can come, etc. If the creative field is, as it sometimes suggests, in the process of reimaging how society relates to the world and how we build our cultures, should we as artists, not be building more inclusive communities that are tolerant not just of diverse bodies and sexualities but of modes and conditions for living. Brett: There are multiple art worlds and the places I have chosen to circulate in have not really noticed, both for good or bad, that there is a child in the mix. The same number of invitations come in. This probably has more to do with waiting a long time to have a child and getting well established than anything else. Artists need to make different kinds of work and take up different issues as well. Making gallery art even when you don’t have a gallery or minimal opportunity to show what you do makes absolutely no sense, yet this is what is taught in just about every university or academy. Education needs to shift dramatically to making more holistic kinds of artistic practice that considers all kinds of issues outside of the usual feigned aesthetic autonomy that most artists insist on. 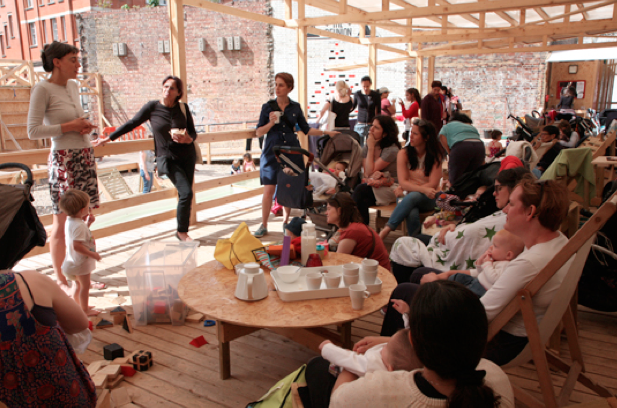 Why not make new kinds of spaces and social experiences as your art? It seems kind of silly to ask this question as it has been something I have been engaged with for over 15 years, but it is still relevant. There also needs to be a serious attack on the “professionalization” of artists, which among many things, leads to almost a complete denial that you have a family. Tremendous bias and bigotry is built into “professional” gatherings and jobs and other infrastructure where art shows up. We have encountered this both in self-organized communities (where you would expect better) and from large institutions. Okay, lastly: Is there any question I should be asking here that you’d like to address? Residencies, education, collaborative practice, funding, etc? 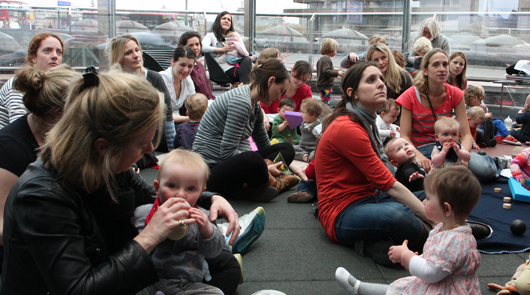 Here is a question you could ask ( I don’t really have a specific answer but there you go): How can we deal with the inherent sexism of the art world when women are still the primary care givers especially of young children?